Unicorn Legend is a online slot set within a magical Kingdom, where it seems the Unicorn is boss. The white creature with a flowing blue mane acts as the wild symbol in this game, ensuring those wins come thick and fast. The unicorn is joined by a fairy, while a Disney-style castle sits on top of a hill at the centre of the Kingdom. A wise owl also features, keeping an eye on the goings on of the magical Kingdom. Fantasy online pokies are a popular genre – and Unicorn Legend is an eye-catching and interactive example. You’ll enjoy with a thought-provoking choice for the free spins bonus feature. The unicorn wild symbol on reels 2, 3 and 4, substituting for all apart from the scatter. Five reels of fantasy themed symbols, with 25 win-lines paying from left to right. Land two or more scatter symbols for an instant win, while three activate the free spins. Choose your number of free spins and the wild multiplier – it’s a big decision to make! Look out for the ‘Emblem’ scatter symbol, which features a heraldic red, gold and green display within a patterned frame. Land 2, 3, 4 or 5 ‘emblems’ anywhere on the reels and you’ll win 2x, 4x, 20x or 200x your total bet size, while three or more emblem scatter symbols will also gain you entry into the free spins bonus feature. 10 free games where any wins with the Unicorn wild will be the subject of a 6x, 8x or 12x multiplier. 15 free games where any wins with the Unicorn wild will be the subject of a 4x, 5x or 6x multiplier. 20 free games where any wins with the Unicorn wild will be the subject of a 2x, 3x or 4x multiplier. The choice is a tough one. If you’re the type of player who likes to guarantee a solid win during a feature, the 20 spins is the way to go, with those smaller multipliers. If you like to go all out for glory, the 10 free spins is the way to go. Yes, there is a chance that the wins will be limited, but if they do hit, they’ll hit big. If you can’t decide between the two, then the 15 free spins might be the ideal choice. Any you find yourself with a winning spin, you’ll find the ‘gamble’ option enabled. Taking the option will see you presented with a face-down playing card. You’ll now simply try to guess the colour of the card to double your money, or the suit of the card to multiply your win by four! Of course, if you get it wrong, your win will disappear. Unicorn Legend is a pokie that plays out on the popular 5×3 reel setup, featuring 25 win-lines that pay from left to right. Both the fairy and the magical Kingdom symbols have four-figure pay outs (2,000 and 1,000 respectively) and each pays for two or more matching symbols in a row (making those smaller wins easier to come by). The owl sits in the middle of the pay table, while the lower paying symbols are the 9, 10, J, Q, K and A playing card symbols. This NextGen Gaming-designed poker machine features a magical setting. Large plants, which might be beanstalks, sit either side of the reels, with a purple, gloaming sky behind. Fireflies illuminate the scene with their specks of light, while a fairy flies back and forth along the title. The mix of colourful symbols only add to the magical feel of the game. The soundtrack is ideal for a Unicorn themed game, where you can almost hear the hooves of the mythical creature. Will Unicorn Legend Make Your Bankroll Stuff of Fantasy? 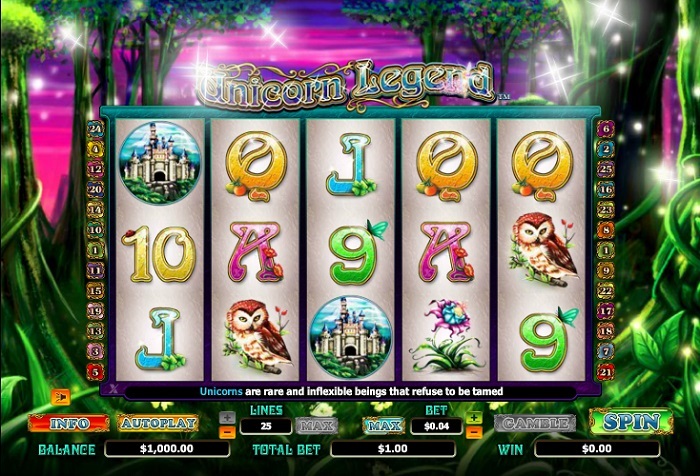 Unicorn Legend from NextGen Gaming is an enjoyable online pokie from start to finish. The design of the game stands out, making the perfect backdrop to the game play. Wins come often in the base game, especially with the Unicorn always able to lend a wild hoof! The real highlight is the free spins option, where you’ll have a decision to make – do you go all out for the big win, or play it safe? With a gamble option as well, NextGen Gaming have come up with a game full of variety.